home > BulkSMS information > CloudSMS is Nigeria’s Most Reliable BulkSMS Service Provider? 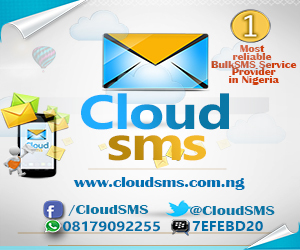 Do you Know that CloudSMS is Nigeria’s Most Reliable BulkSMS Service Provider? CloudSMS is dubbed as the No 1 in Customer service in Nigeria. CloudSMS is used for sending Instant Customized SMS to Numerous numbers at once. CloudSMS is a product of CloudWare Technologies, Nigeria’s Leading Technology Solutions provider.